Warm milk can make a world of difference in getting your baby to take a bottle, and a bottle warmer is a great way to achieve this without making a mess of your microwave or splashing lukewarm tap water all over your kitchen. The best such bottle warmer we tested was the Dr. Brown’s Natural Flow Deluxe Bottle Warmer. A small preface before we dive into the nitty gritty: A bottle warmer is by no means a must-have product for new parents. It can be a real convenience, but it can also take up useful counter space and add time to the frequent feedings. Also, some babies will happily take a bottle at any temperature. But for those parents who have the space or who have fussy little ones, we recommend using a warmer to ease the headache of feeding. To reach our decision, we compared and tested dozens of models of bottle warmers in our homes over the course of two years with two different testers/researchers putting both Dr. Browns and many top competitors to the test. We talked to experts, parents, and childcare professionals about their personal experiences with bottle warmers and with babies’ general tendencies about bottle temperatures. 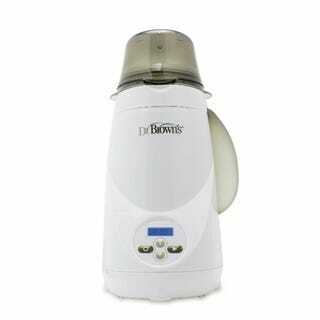 We tested numerous models on their ease of use, speed and basic functionality to reach our top pick, the Dr. Brown’s Natural Flow Deluxe Bottle Warmer. Parents who want to warm bottles for frequent feedings will find that a bottle warmer saves them time, while also making feedings more productive. A cold bottle is a shock to the system, especially after a nice nap. Bottle warmers will get the majority of their use during the first 12 months of life, wherein bottles are a constant. As mentioned, bottle warmers are not a necessity for every baby and every home, but if you find yourself trying to warm up bottles under the tap or contemplating the microwave (please don’t! ), then a bottle warmer is worth the counter space and moderate price tag. What Makes a Good Bottle Warmer? The first patent for a bottle warmer dates back to the 1930s. Generally speaking, the functionality of bottle warmers has remained the same since then: use hot water outside of a conductive bottle to warm the contents inside. This meant kettles, hot tap water and even water heated by car engines were used to warm bottles. The 1946 advent of the microwave oven and the mass adoption of the appliance in the 1970s and 1980s threw a wrench into the bottle warming product line. Now you can throw a bottle into the microwave, zap it for a dozen seconds and be ready to go. However, doing this comes with huge risks. Expert Suzanne Barston from FearlessFormulaFeeder.com says, “The biggest safety issue with [microwaving bottles] is ‘hot spots’—the microwave heats liquid unevenly and even if you test the bottle to make sure it’s not too hot, the middle of the bottle could be scalding hot and burn your baby.” Rapid heating can also destroy nutrients in the milk. Finally, anyone who has ever watched a Hot Pocket explode can attest to the decidedly unfun experience of cleaning out the inside of a microwave. That’s why nearly all bottle warmers use warm water or steam to heat the milk. What else makes or breaks a bottle warmer? The water. Because bottle warmers operate by heating water or creating steam, water has to be added to achieve the function. Some bottle warmers include reservoirs to store water as you need to use it. Others require you to add water with every bottle and some include complicated conversion charts of precise measurements of water to add. Safety. Safety features are a must-have for a device like a bottle warmer that can get dangerously hot. Automatic shutoff, a sturdy and heavy base and even a lid can prevent mishaps with hot water. Ease of use. Foggy-brained parents know that the easier to operate, the better. Excessive switches, dials and settings can turn a pretty simple device into something requiring thorough training. Multi-tasking ability. Some bottle warmers will also heat jars of food and can act as sterilizers. We also appreciate bottle warmers that are adaptable to different sizes and shapes of bottles. Price. Generally, bottle warmers are mostly affordable in the $20-30 range for a product you could potentially use daily. Our testing began with a thorough investigation of other reviews and customer reviews of several warmers. We spoke to parents, experts and childcare providers to find products and methods to test for warming a bottle. A total of eight bottle warmers were tested in homes with day-to-day use and a handful of traditional methods were tested (running tap water, a crock pot of water, etc). After weeks of in-home testing and comparing it to other bottle warmers, the Dr. Brown’s Natural Flow Deluxe Bottle Warmer rose to the top because of its ease of use and uncomplicated design. The two features of the $33 Dr. Brown’s bottle warmer that helped it achieve this status were its large translucent water reservoir and its digital display with a memory. You don’t know the value of a water reservoir until you try a bottle warmer without one. There are no special steps that require measuring out tablespoons of water at a time: this one utilizes a side-attached reservoir that gave us up to 12 bottle warmings before needing to be refilled. Trust us, when you’re frantically trying to warm a bottle as a little one is screaming at you, the fewer steps, the better. And because it warms by steam, you don’t have to worry about a lot of stagnant water in the machine attracting bacteria and mold, a common flaw on other models. bottle warmers use knobs to select varying levels of heat (turn the knob to one if you’re warming room temperature milk, two for refrigerated milk, three for frozen milk, etc. ), but the Dr. Brown’s has a simple digital display with a timer. And most importantly: it saved the last time you used! No need to fine tune a knob to where you THINK you remember the ideal temperature, the Dr. Brown’s remembers it, saving your foggy mind and speeding up the process. Other pluses of the Dr. Brown’s include the audible timer and ending chime, as well as a well-designed cap that keeps the steam in and makes for a more efficient bottle warming. We also liked the display, which has a blue backlight that can seen bright and clear in sunlight and pitch black darkness. No product is immune from complaints, and the Dr. Brown’s earned a couple. The opening of the warmer is a bit narrower than its competitors’ at 3.1 inches. That narrow opening made a very, very tight fit for the wide Tommee Tippee bottles. Anything wider may not fit at all. The Dr. Brown’s warmer is also one of the tallest we tested at 9.6 inches and may not be able to stow away as easily. Finally, Dr. Brown’s recommends not heating milk in plastic bags, which could affect pumping moms that want to go from frozen bag to warmer to bottle. The Kiinde Kozii is nearly twice as expensive as the Dr. Brown’s and can do many of the same tricks, but with one notable difference: it uses a technology to circulate warm water around the bottle. This means that it takes longer to warm the bottle, but is the best at maintaining the the healthy benefits of breast milk. Quick heating and overheating milk can zap out some nutrients, but the Kozii guarantees that won’t happen. It also allows pumping moms to drop the bags of milk right into the warmer. The First Years Babypro Quick Bottle Warmer is the best no-frills option for warming bottles. It costs $15 and has one button to turn it on. The amount of water you add to it determines how long the device runs. An included measuring vial and chart tells you how much water to add. For the occasional bottle warmer needs, the First Years Babypro Quick Bottle Warmer is simple and affordable, but if you find yourself starting to warm bottles more frequently, you’ll miss the nice features like a water reservoir and the ability to fine tune your heating time. We also took into consideration the following brands but ultimately chose differently. Tommee Tippee Electric Bottle Warmer: We decided to not test this product despite its positive reviews because it doesn’t have one feature we determined to be a priority: an automatic shut off. Philips AVENT–This bottle warmer replaced the previously discontinued and tested AVENT Express. We appreciated the ultra-wide opening, but the lack of features compared to our pick couldn’t be overlooked. Boon Orb Bottle Warmer–This warmer got so hot during the heating process, the plastic bottle we tested was softened as if starting to melt already. Munchkin Precision Digital Bottle Warmer–Though this choice has a number of similarities with our pick, it is substantially less popular in terms of reviews with many complaints of the warmer leaking very hot water. Baby Brezza Formula Pro One Step Food Maker–This warmer is for formula use only. It is out of the price range the average parent can spend. It does have additional features though and actually mixes the bottle bubble free in addition to warming. Chicco Bottle Warmer–Again, this bottle warmer is priced the same as our pick but simply has fewer features. Chicco Naturalfit Digital Bottle Warmer The digital display and sleek design were nice, the required precise water measurements and high price tag made it tough to keep using. Gland Baby Food and Bottle Warmer–We liked the digital display and controls that are set by ideal temperature, but odd lack of instructions out of the box and setting only availability in Celsius were off-putting. Born Free Tru-Temp Bottle Warming System–Although this warmer has more features than our pick, it is priced higher and has many bad reviews that complain about the company’s customer service. As with coffee makers, Keurigs, and the like, bottle warmers have recurring issues related to stagnant water and require regular cleaning and maintenance no matter which bottle warmer you end up with. When you’re ready to clean the bottle warmer (which, depending on use, should be once every two to four weeks) wipe all exterior and interior surface you can reach with a rag and a very mild cleaning solution. Avoid harsh solutions and bleach. Remember, many of these heat to the point of boiling and you don’t want those chemicals airborne and inhalable. To descale your bottle warmer preventing mold in the deep recesses, run a solution of one part white distilled vinegar and two parts water through the machine. Doing this once per month should alleviate any stagnant water and mold concerns. In the event of a spill or leak of milk into the bottle warmer, clean and descale it immediately. Obviously, make sure your bottle warmer is unplugged when you’re not using it. And in cases of bottle warmers where you pour the water into the main reservoir, you might want to turn the reservoirs upside down to let dry after every use. As for maintenance and repair, Dr. Brown’s manufacturer offers a one-year warranty and a customer service line to help out with any lingering issues. A large reservoir, dead simple programming style, and ease of use makes the Dr. Brown’s Natural Flow Deluxe Bottle Warmer the best pick. When your baby needs warm milk, this $33 bottle warmer will save you headaches, wasted water, and risking your child’s safety with traditional home methods for heating bottles. Meek M.D., Joan Younger. The American Academy of Pediatrics New Mother’s Guide to Breastfeeding.